The Samuel AdamsBoston Lager Cut runs at a 45 degree angle to the rest of the muscle, yielding a tightly grained steak perfect for grilling and slicing. This carving method optimizes the Cut’s cooking properties and flavor potential, enhancing the pairing capabilities. The beef and beer intersect with great caramel notes and sweetness, while the elegant hoppiness of Samuel Adams Boston Lager finishes the lingering meaty flavor of the Cut. To achieve the recommended medium-rare to medium temperature and make the most of the cut’s beefy flavor, Dickson suggests searing the steak on high heat for four to five minutes per side. For a more well done cut, follow the searing with four to five minutes of indirect heat in the oven. In many ways, the growing appreciation for American craft beer parallels the development of appreciation for American wine thirty years ago. Beer’s complexity, offset by its core ingredients, hops and malted barley, provides layers of flavor to dishes and with pairings that wine could never achieve. A full-flavored beer often pairs better with bold, flavorful meats, than wine does. The brew’s complexity, malty sweetness and intense hop notes, pair well with and are not overpowered by rich flavorful foods or caramelized grilled flavors. The Cut is currently being sold at Dickson’s Farmstand Meats in Chelsea Market and will be available at select David Burke restaurants. A similar type of cut can be ordered through specialty butcher shops by requesting a three-quarter inch cut from the cap to the top sirloin. The “fat cap” should be left on to aid in cooking the cut properly. When cut correctly, it will resemble a leaner New York Strip or Shell Steak. 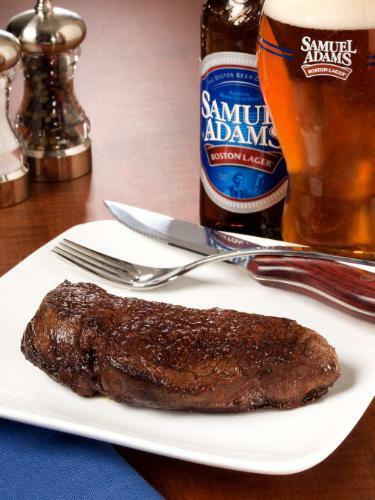 While this cut is specially designed to be the perfect pairing for Samuel Adams Boston Lager, the full-flavored craft brew pairs well with any type of beef dish from burgers to steak and everything in between.